I had been looking for a way to complete the P37 rig without the large basic pouches, and these patrol pouches fit the bill perfectly. I could have gotten the brace adapters, but then there would have been no storage without other additional pieces. 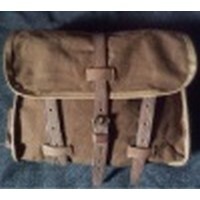 I find the patrol pouches are the perfect medium between the basic pouches and the plain brace adapters. You get some storage space in the form of four pouches which attach via the same buckle system (2 per buckle)as the basic pouches. These are much smaller though in profile and don''t interfere at all with your legs. The color is slighly more greenish than the rest of my rig, but the pouches don''t look out of place. Worth mentioning is that I received my order very fast. The order was placed on a Thursday afternoon, and the package was in the house by Saturday - impressive. No part of the order experience was unpleasant, and I''m thoroughly pleased with my item.